El Averno was the 85th champion, having won it on November 30, 2007 in Arena Mexico. The championship is current inactive. The NWA World Middleweight Championship dated back to the early 1920s. The NWA name only existed to establish it as a world championship; since the 30s, it has been property of EMLL (much later CMLL.) It's one of the oldest active wrestling championships in the world. Corazon de Leon won the championship on December 7, 1993 by defeating Mano Negra. Negra had defeated Bestia Salvaje in a hair match the night prior, but suffered an ankle injury during the match. Leon attacked the hurt ankle, beating Negra in the same straight falls via anklelock. This would be the last time this title would change hands in a CMLL ring for over a decade. For most of it's existence, the NWA World Middleweight Championship been held by Mexican wrestlers and defended in Mexico. In 1994, the title was sold to Ultimo Dragon, who brought it to Japan to be defended first by himself, and later as a championship belt for his promotions. When Ultimo Dragon left Japan to join WWE in 2003, he sold the belt back to CMLL. CMLL did nothing with it for a year, before doing a decision match with no particular build up. Black Warrior won the belt from Mistico, as part of the lead up to their mask match, and to provide big rematches after Mistico won the mask. Mistico was finally able to get the belt back on Kid's Day, 2007. Averno won the belt back from Mistico in November of 2007. Despite holding the belt for almost 3 years, defenses were rare and the championship was rarely considered. On August 12, 2010, CMLL announced a change with the NWA group of championships. The current physical title belts were all retired, replaced by newly belts with a different design. The old belts are now part of CMLL's mobile museum, though copies of them have turned up elsewhere. CMLL referred to the new championships as the CMLL Historic Championships and said the former NWA champions would be the first champions of the new belts. Outside not getting the physical belt back, that appeared to satisfy the NWA's complaints about using their trademarks. However, since within weeks of that press conference, CMLL had changed course. The championships were referred to as NWA World Historic Championships. This title has not been revived by NWA Mexico. 9 Sugi Sito Tarzan Lopez 1950.09.21 ? 11 Tarzan Lopez  ? 1952.07.13 ?
? Rolando Vera ? ? 25 Rene Guajardo  Apolo Curiel 1967.07.29 ? 63 Gran Cochisse  Chamaco Valaguez 1986.05.18 ? 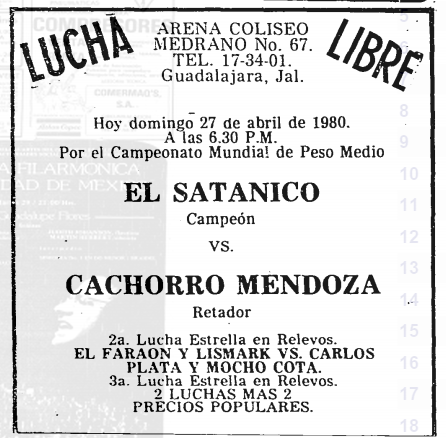 ↑ El Informador 1977-04-10, Mendoza apparently beat Adorable Rubi the previous shot to win a title shot. Guajardo left EMLL in 1974 to form the promotion which would eventually be known as LLI. Guajardo was NWA Middleweight Championship at the time. The NWA, working on behalf of EMLL, declared the championship vacant. Guajardo appears to have continued to defend the title anyway, perhaps until the UWA World Middleweight Championship began. This page was last edited on 23 April 2019, at 13:33.